Product information "Creatinine (urinary) Colorimetric Assay Kit"
Creatine is synthesized in kidney, liver, and pancreas and transported to muscle and brain where it is phosphorylated to phosphocreatine. Some free creatine in muscle is converted to creatinine. 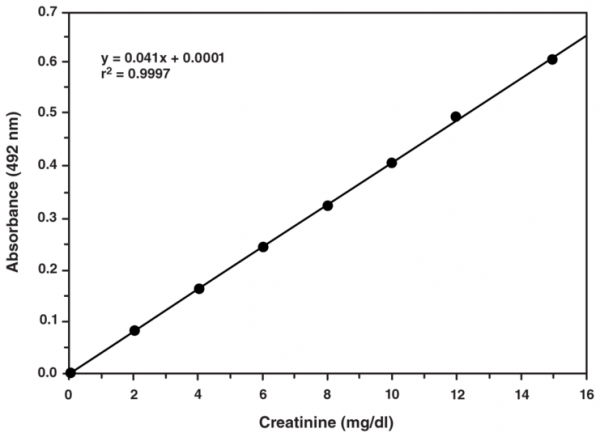 The amount of creatinine produced is proportional to an individual's muscle mass. In the absence of renal disease, the excretion rate of creatinine in an individual is relatively constant. Thus, urinary creatinine levels are commonly used as an index of standardization for a variety of other tests. Measurement of creatinine clearance is also useful in detecting renal disease and estimating the extent of impairment of renal function. Customer review for "Creatinine (urinary) Colorimetric Assay Kit"